…sure we speak for everyone when we say the holiday season can be a bit crazy and it can be hard to figure out that perfect gift for everyone on your list. The good thing is, most people just want something thoughtful. 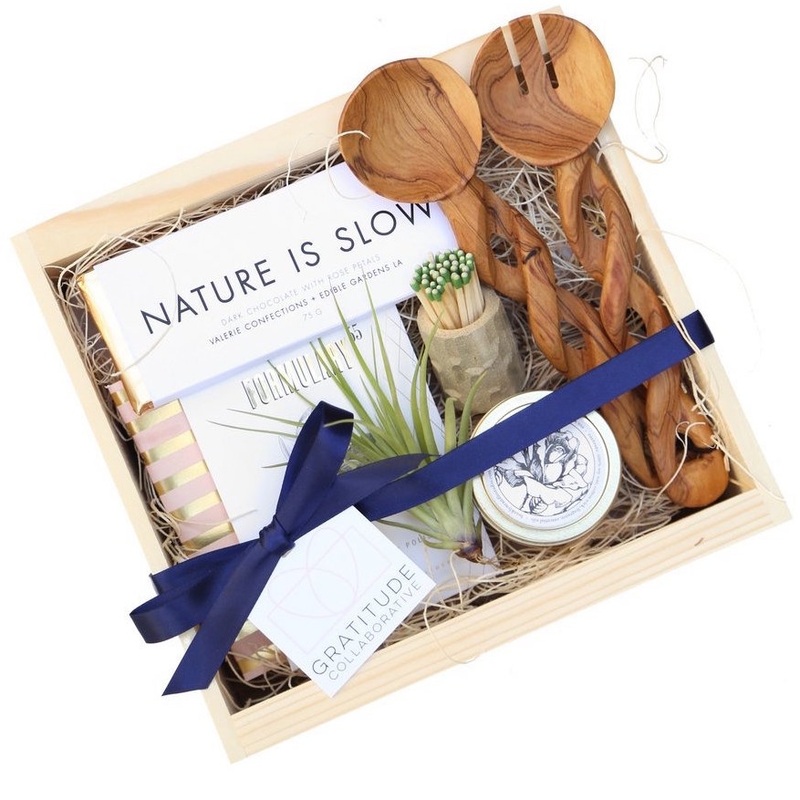 For this reason, we love Gratitude Collaborative, a boutique gifting studio offering high-end products like local artisan made small-batch goods using the highest quality ingredients and materials. All gift boxes have a donation built into their cost that goes directly to charitable sources. The sale of each box provides meals to those in need. We tapped into Dana Renée Ashmore, Founder of Gratitude Collaborative, to hear more on how she creates the most beautiful gift boxes, while doing good. My favorite thing to do is hand-craft something for every gift that I give. I make everything from lip balms to tea blends and tea towels. For these gifting examples I decided to use a tea towel that I made last week. I made a vat of dye using clippings I sourced from an indigo plant from @yesgraham, local to Los Angeles. If you don't know how to use fresh indigo, you can buy kits on Amazon. You can also use other natural dyes, as well. Here are four gifting options that you can put together with a handmade item for all the people on your list. …your friend that could use some cuddles. This is something that you can put together with a wooden box or basket. Find a special stone that means something to you. I included Amethyst because it is a natural stress reliever with healing properties that get rid of negative energy and encourage inner strength, wealth, and clarity of the mind. I love to add tea and I love the brand Leaves and Flowers because all of their teas are sustainably grown and harvested, and they are local to LA. Hit up your local farmers market, or if you have any unused tea in your cupboard, it’s an easy addition. Bud vases are great -- they are sweet and easy for the busiest of people, and there’s always a place for them. I pick rosemary, mint and lavender, and put a few sprigs in all year round. This one is by Lucy Michel. Finally, you can find a great tea spoon anywhere. A nice touch is adding a few loose leaf tea bags tied with ribbon. This spoon is from The Little Market. They are an amazing gifting company that also gives back. …the hostess. This box includes a Spiritual Kindling Bundle that is a great host/hostess gift. Each piece is collected by hand and ready to burn. 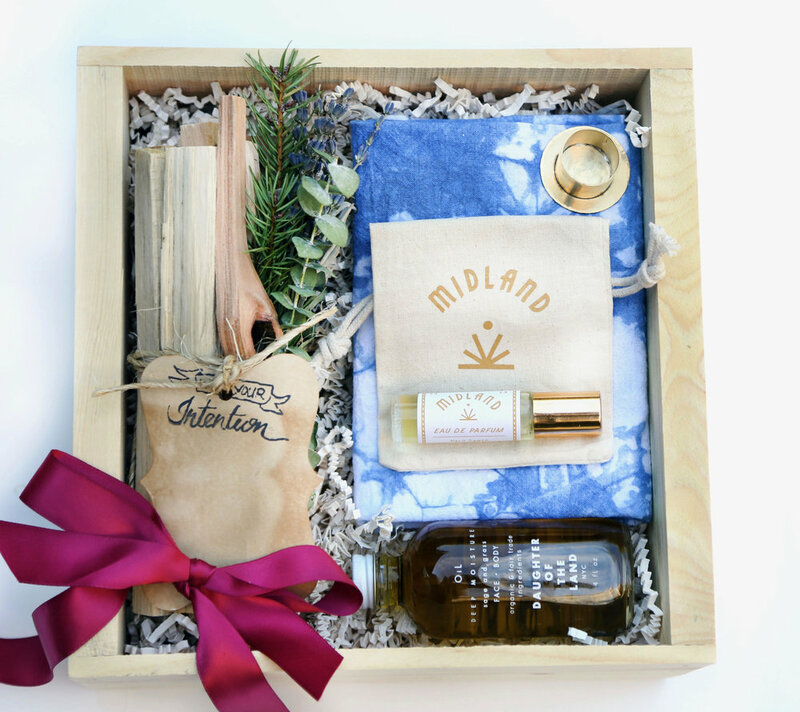 The bundle comes with an intention card, a unisex scent roller to evoke a sensual, earthy, and rich aromatic experience from MIDLAND (my favorite shop in LA to find unique gifts), a MLKNDHNY handmade Palo Santo burner for medicinal and therapeutic purposes, and a Daughters of the Land body oil which feels great this time of year. …the person that you’re not sure what they will like. I always try to gift something unique and fun but still super easy to execute. You can get a vendor from your local farmers market to give you some dried corn. Then, you can include paper sandwich bags and instructions for making popcorn, and the recipient of your gift can have a new way to make a delicious snack. It’s something I’ve found to be so much fun with my son. Who doesn’t love/need coffee? In the pictured box, we included Canyon Coffee, one of our favorites. Something that could be masculine or feminine is a bottle opener from Black Dog Ironwork and some incense with good intentions, from WONDER VALLEY. …you don't have a wooden box, another idea is to use any tea towel (or the one you made), and wrap up all the items and make a parcel for gifting. What you do is lay the tea towel completely flat on a hard surface and put your items in the middle. Take two diagonal ends of your tea towel and bring them over the top. (If you have the upper left corner in your left hand, you will use the bottom right corner in your right hand.) Tie those two ends together and tuck them in, then take the other corners and tie them together on top of the knot you just made. Then you have a parcel! I added rosemary and a tag, and it makes the prettiest host/hostess gift without the cost of a box!